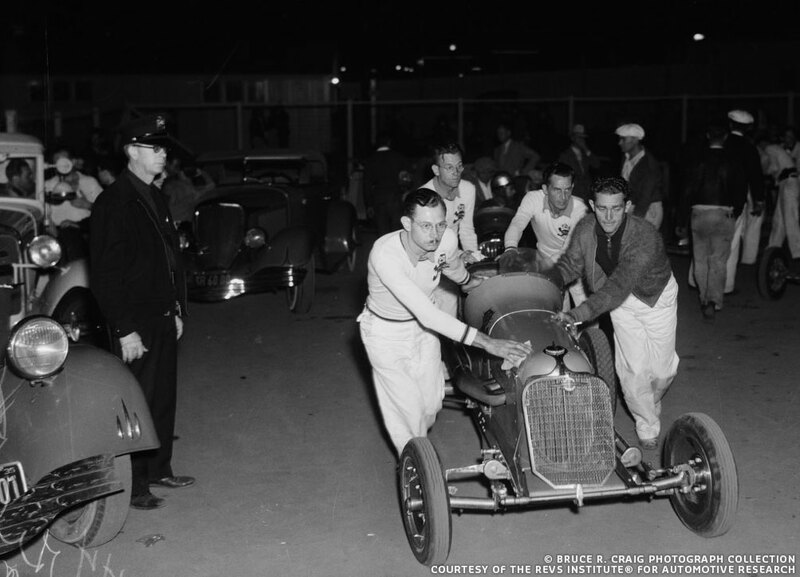 In the 1930s and 1940s, Midget Racing was very popular. 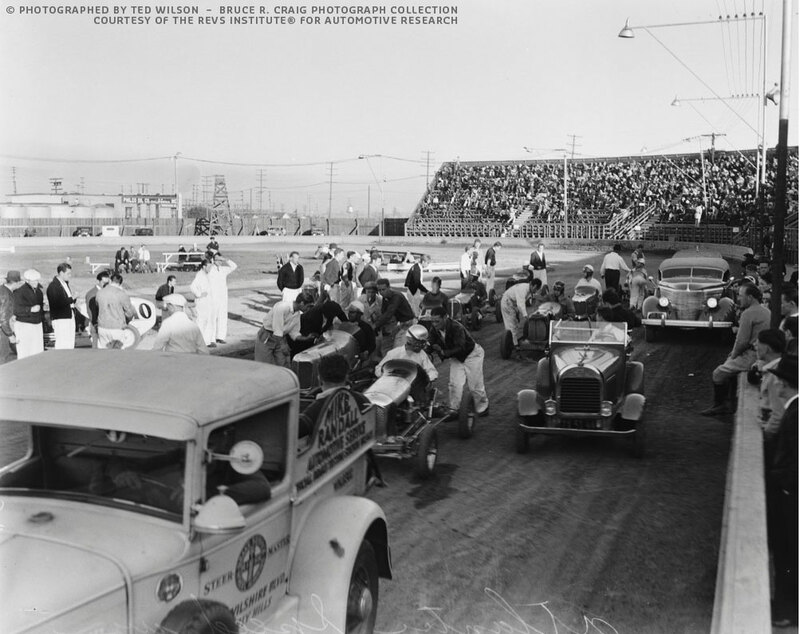 A good way to get attention for your automotive business was to customize the cars and trucks that would start the midget at the stadium races. 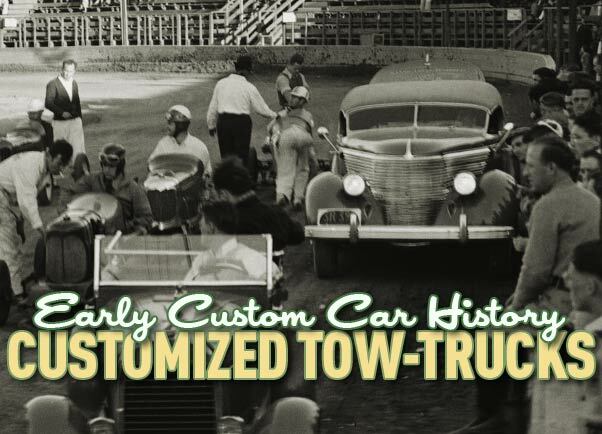 While browsing the amazing and extensive Photo Collection of the Revs Institute® Archives I came across some known and some unknown 1930’s Customized Tow/Push trucks. I have always loved the early Customized cars from the 1930’s and early 1940’s. Restyled with pure and unique designs, not influenced by any of the magazine and books. Some of the companies that specialized in restyling cars and even offering restyling products were Frank Kurtis, Jimmy Summers, Don Lee, and George DuVall who worked out of the So Calif Plating Company. There were quite a few more, but these are the names that have been responsible for a lot of the early restyled cars that left an impact then, and still do today. Cars that that were trend setting, cars that feature restyling elements that we still use today. Some of these shops were also heavily involved in midget racing. And these races were besides having a great time racing cars, also a great way to promote your business. A lot of these midgets were beautifully designed and crafted. Loads of chrome plated hand made parts to show of the work that could be done by the sponsoring companies. Besides the wonderful race cars the tow and pull trucks were also restyled, to make more impact, and again to show of the quality and capability of the shops. Rolling advertising. 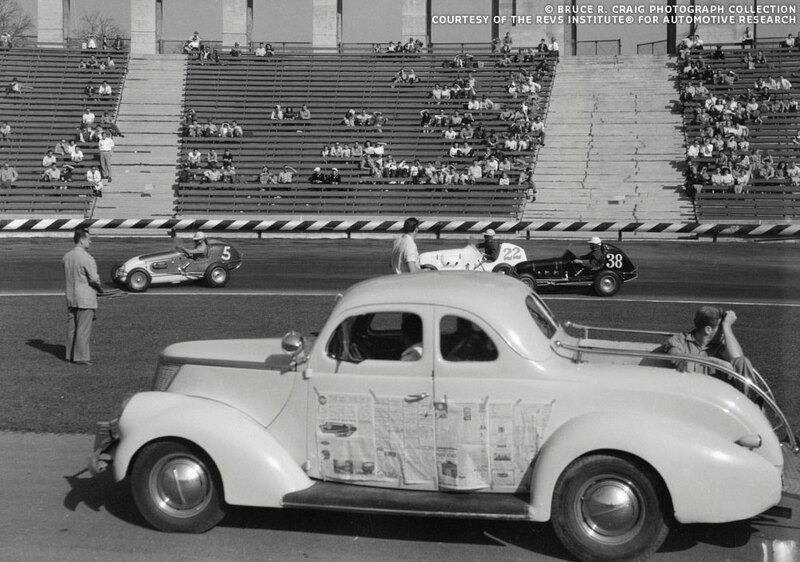 Lets take a closer look at some of the great looking customized tow-trucks at several of the famous Californian race tracks from the 1930’s and early 1940’s, based on the photos form the Revs Collection. To further illustrate these cars we have added a few photos of the used cars from other publications. 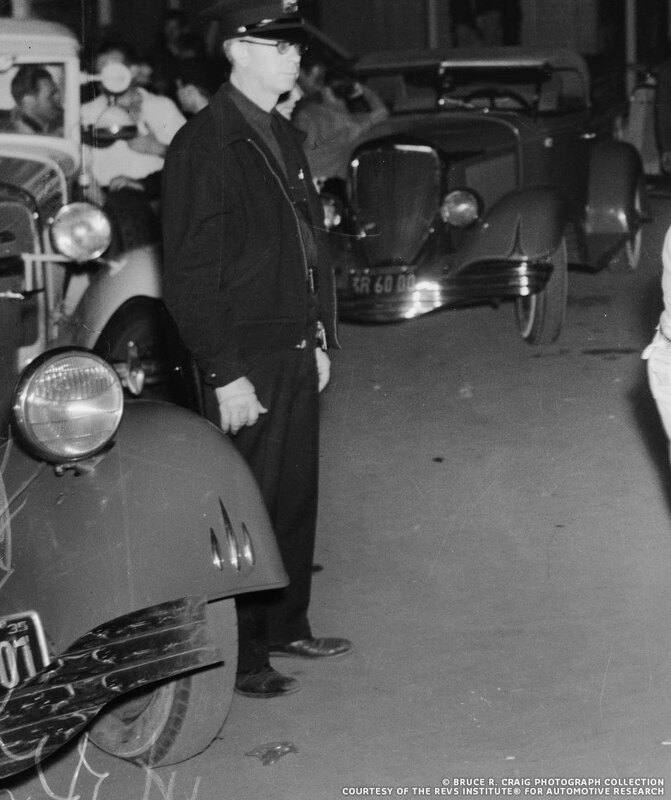 A lot of the races took place at night and the flash light of the photographer captured only what was close, but sometimes the background showed some very interesting cars in the dark. I was intrigued by the wide bumpers on the cars on the right of this photo, vaguely remembering their slight V-shape. When I lightened the photo somewhat I was able to recognize two of the early SoCalif Plating Company trucks in this 1935 photo. 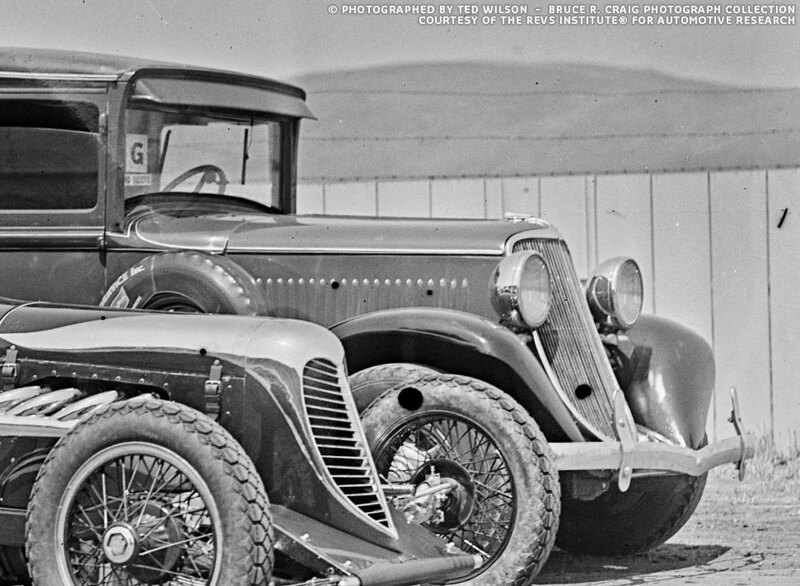 The one on the left, showing only the bumper and front fender is based on an 1932 Ford pick up and the one on the right in the background on an 1931 Ford pick-up. 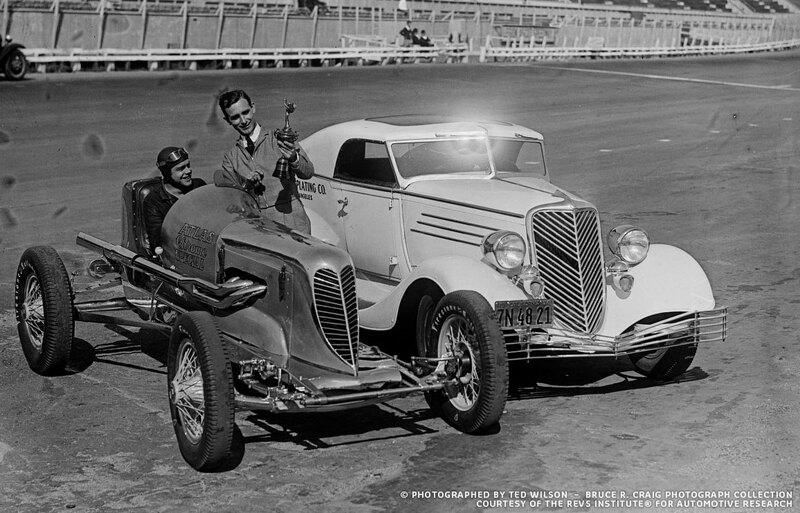 Only very few photos are known to exist of these two cars restyled by George DuVall, and seeing both of them in one photo is really unique. This is one of several designs George DuValle created for the SoCalif Plating Company trucks. 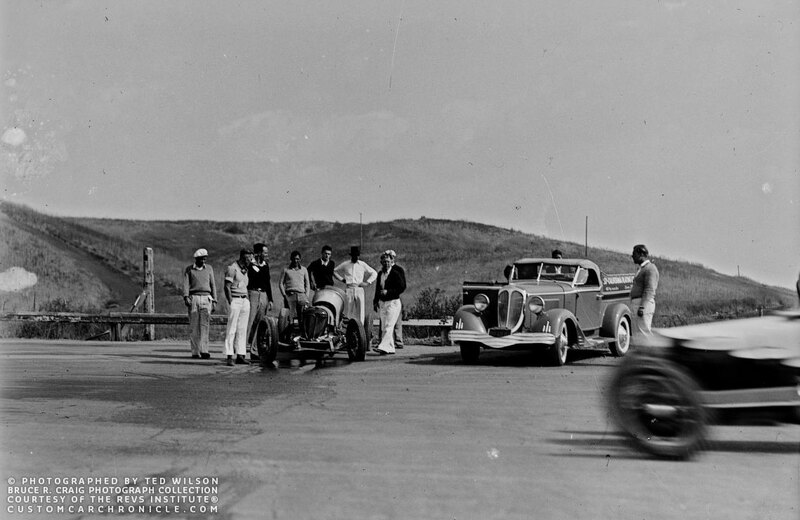 Ted Wilson photographed the car in the early 1930’s at one of the race tracks. Enlarged section of the Ted Wilson photo gives us a good look at the truck. Sadly the background of the photo is a bit blurry so the view of this 1931 Ford pick up truck restyled by George DuValle is not the best… but still very interesting. Notice the custom made waterfall grill. This photo is possibly taken at the same location as the one above. On the far right we can see the rear of the what I think the 1931 based truck. If you look hard you can see the So California Plating sign on the sides of the pick-up bed wood planks. And on the left we can see in the background another wood sign reading California Plating, most likely from the 1932 Ford pick up. Notice that the trunk on the light colored convertible on the left has been removed and chrome plated bard have been added to the sides. The crew would sit in the trunk when puling the midget at the start. Ted Wilson captured one of the So-Califorinia Plating truck in the background. This version shows large low mounted headlights. 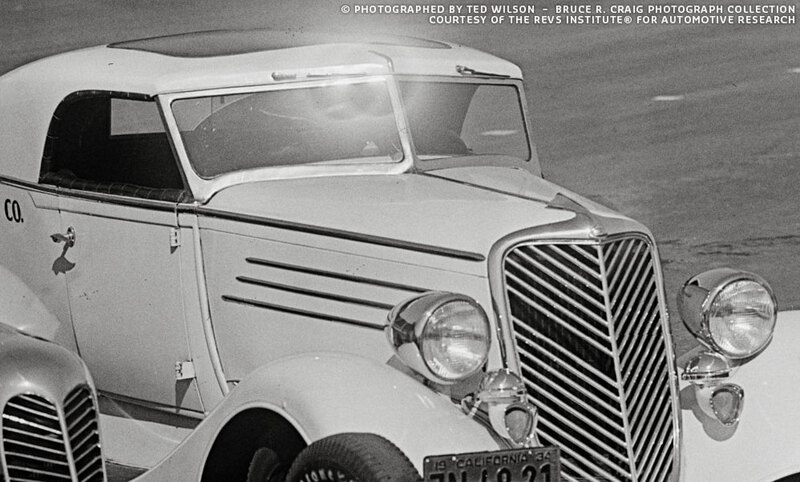 Magazine published photo of the 1931 Ford restyled by George DuVall. The headlights on this version of the truck are different (larger) and mounted lower on the front fenders. The 1932 Ford Roadster pickup based So-California Plating Co. truck was also designed by George DuVall. 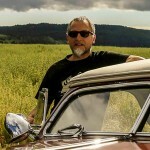 Frank Wearne sits in car number 57, the Atlas Chrome Special, with a wonderful restyled front end. 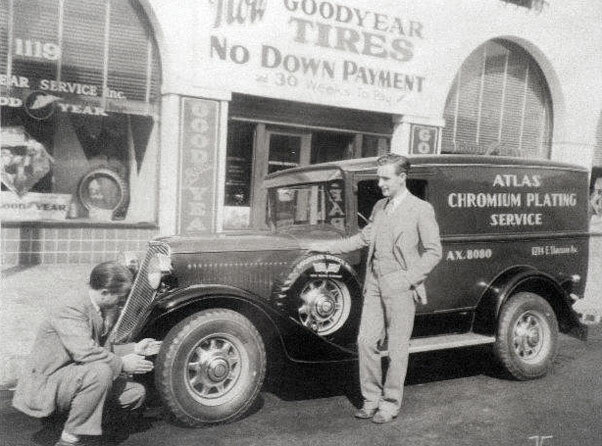 The Atlas Chromium Plating Service 1931 Dodge Panel tow-truck with modified front with 1933 Ford grille behind it. The photo was taken in Los Angeles, exact year unknown. 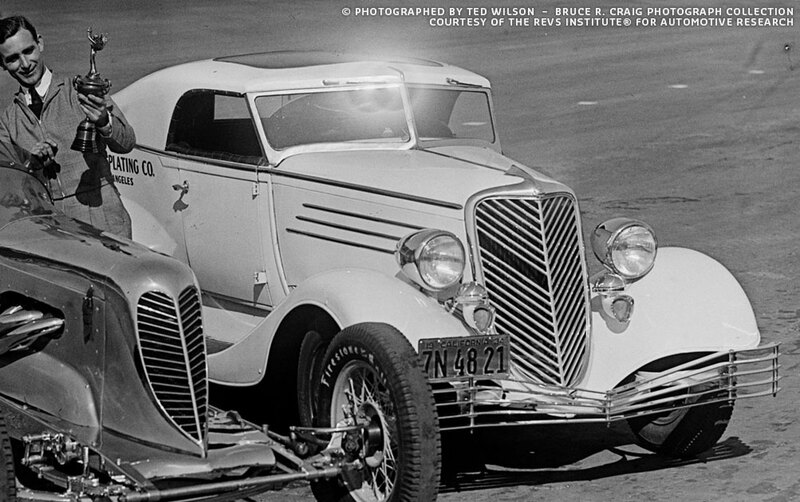 Close up of the front end of the car with the modified hood and hood sides to accept the 1933 Ford grille. The front fenders were also reshaped. Atlas Chrome Plating 34 Ford Truck. 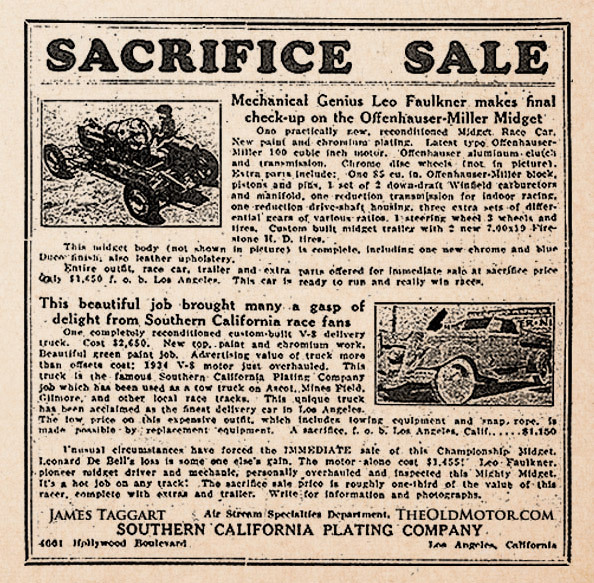 Beside the So Calif Plating Company there was also the Atlas Chromium Plating Service who basically did the same work, and was also sponsoring the midget races. The Atlas Chrome Plating 34 Ford truck was restyled by Frank Kurtis it was actually a 1929 Ford to witch a set of 1934 Ford fenders, hood and grille was added. The truck featured a home made cast V-windhsield and hand shaped top. 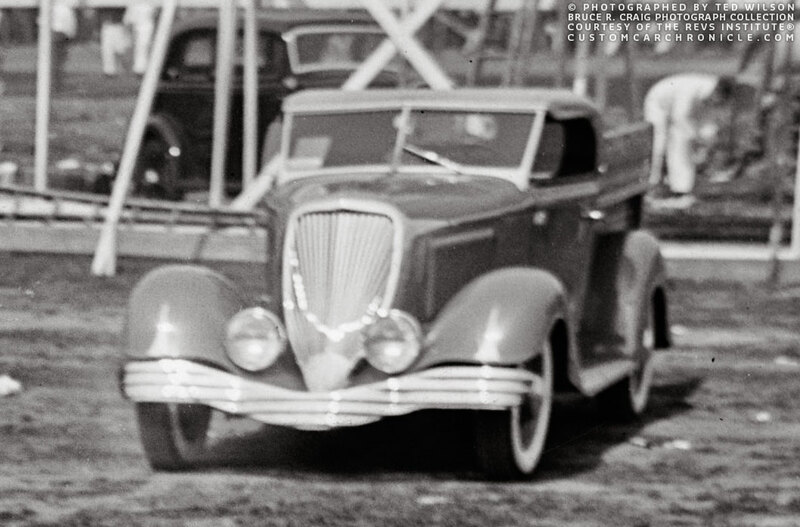 Frank also created uniquely styled bumpers obviously influenced by the coachbuild creations from the early 1930’s. Ted Horn admires the best appearing car trophy the company just won with the Atlas Chrome Special. Closer look shows the wonderful V-windshield with wipers on top, the waterfall grille with one bar missing and the chrome plated long teardrop shaped headlights. The top was done in metal, but had a similar shape as the padded tops. S0 Calif. Plating Company 35 Ford Truck. 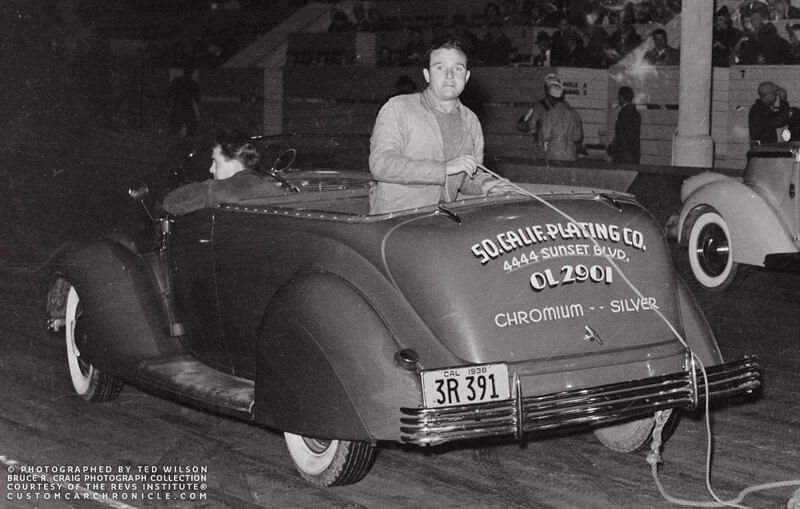 We recently did a full article on the 1935 Ford truck restyled by George DuVall for the So California Plating Company. So please look there for many more photos and info on this amazing early Custom. But we wanted to include two unique photos of the car from the Revs Collection. In two of the start line photos taken at an 1930’s midgets starting line-up photo taken by Ted Wilson at the Atlantic Speedway, in South Gate, California, we spotted the 1935 Ford with added headlights and opened trunk. 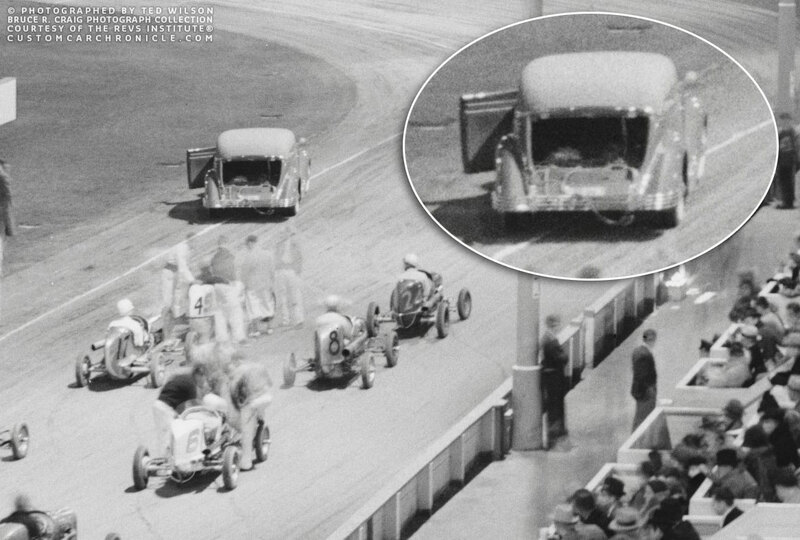 Sadly the photo from the Revs Archives was not dated, but judging the other tow truck and midgets in the photo we assume the photo was taken in 1936-37. A little out of focus, but still very unique to see this version of the SoCalif Plating Company truck with the added headlights. This photo shows clearly that the original small set in headlights are still in place. Other than the new headlights the car appears to to have changed. Notice the lettering on the open trunk. So Calif. Plating Company 36 Ford. Pat Ganahl shared a photo of another So Cal Plating trunk styled in a similar way as the famous ’35 truck, in his excellent story in the Rodder’s Journal issue 36. 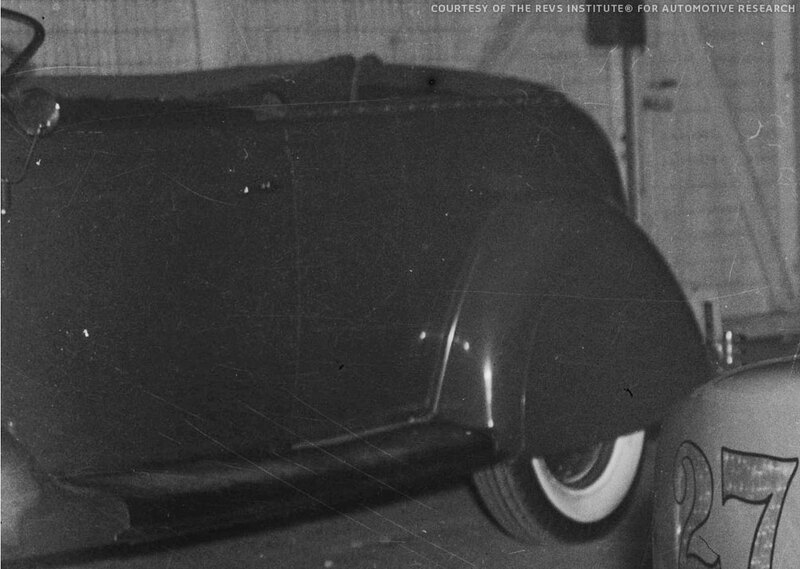 The car was listed as an 1938, but with the help of Lynn Bird we now know the car was actually a late 1936 Ford convertible sedan. 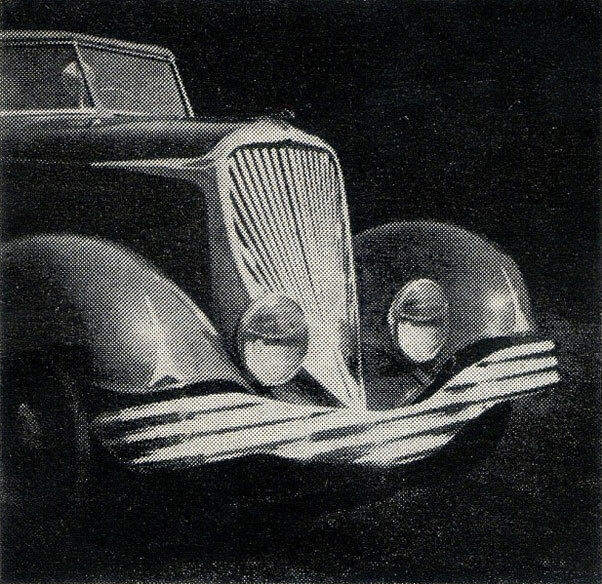 We do not know much about this car, and according the RJ article there might even be yet another one similar styled as the 1935 truck. But so far we have not been able to find any photos of that one. 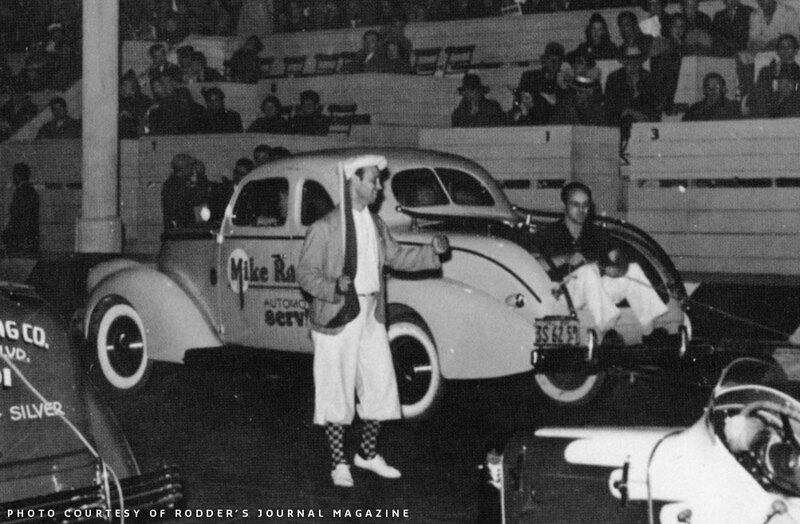 The Revs Archives does have another photo of the car pictured in the Rodder’s Journal article. And even though most of the car in the photo is covered by three guys, we still are able to see some of the front of the car. Styled in a similar, yet different way than the ’35 truck. The other So-Cal-Plating “truck”. This one is based on a late 1936 Ford Convertible Sedan. 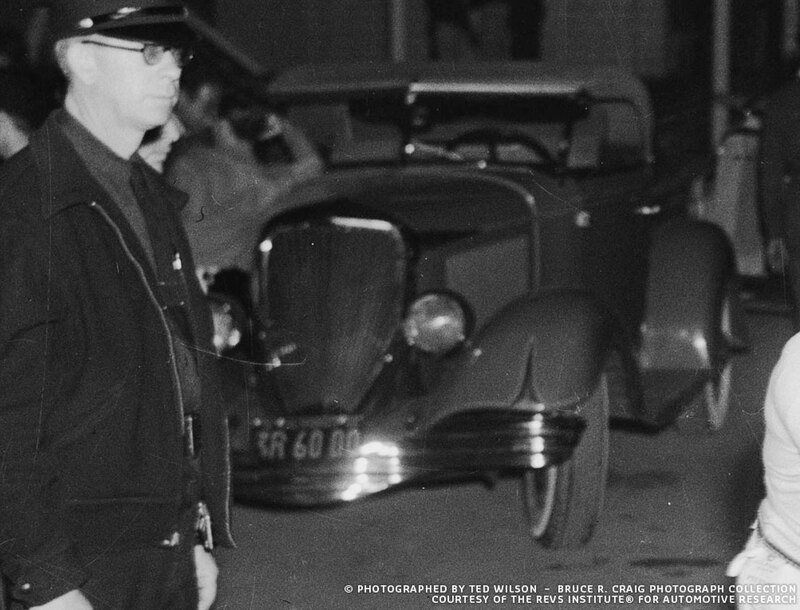 the photo was taken in 1938 and shows that there is no top on the car as we can see in all the photos of the ’35 Ford. 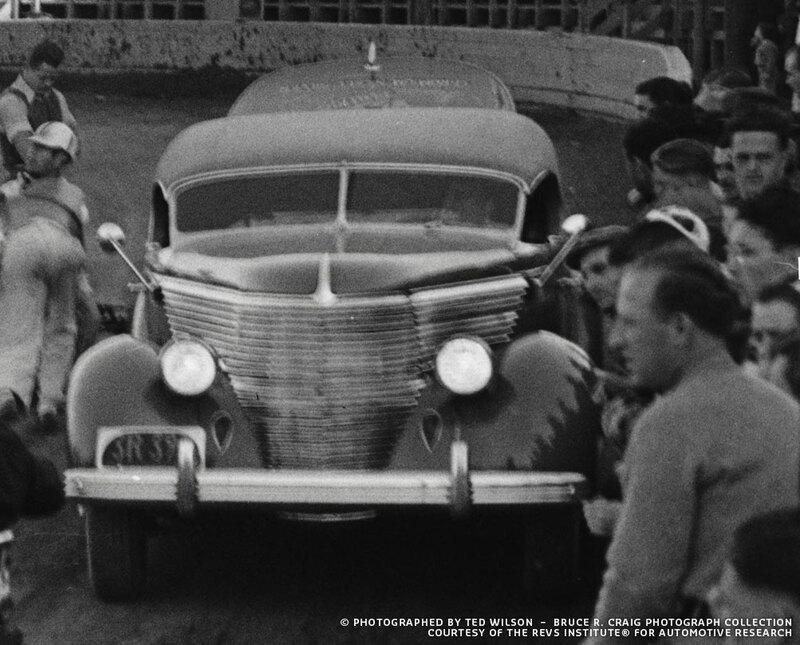 The grille bars look to be a taller and less in number than on the original 1935 based car. The front bumper is also quite different, interesting to see the wrap around sections appear to be separate units. According the Revs site the guys in the photo are: Dominic Distarce, Sam Hanks and Karl Young. 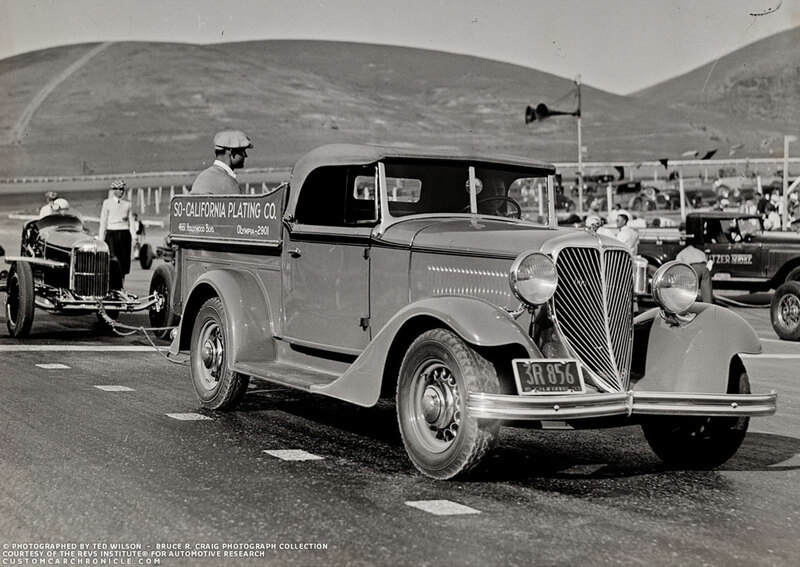 This is the photo that was taken by Ted Wilson in 1938 and show the 1936 Ford So Calif. Plating Co. tow-car in action. The great quality of the Revs Collection photos allowed us to zoom in on the machine turned dash in the 1936 So Calif. Plating Co. Ford. 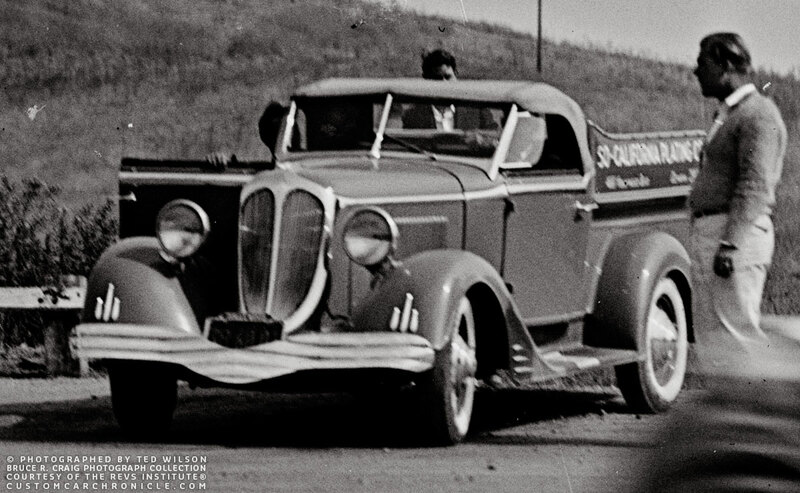 In the background of a photo I spotted this portion of the So Calif Plating 1936 Ford with the Du Valle Windshield. It does not show much of the car, but since photos of it are so rare, I wanted to include it here anyway. 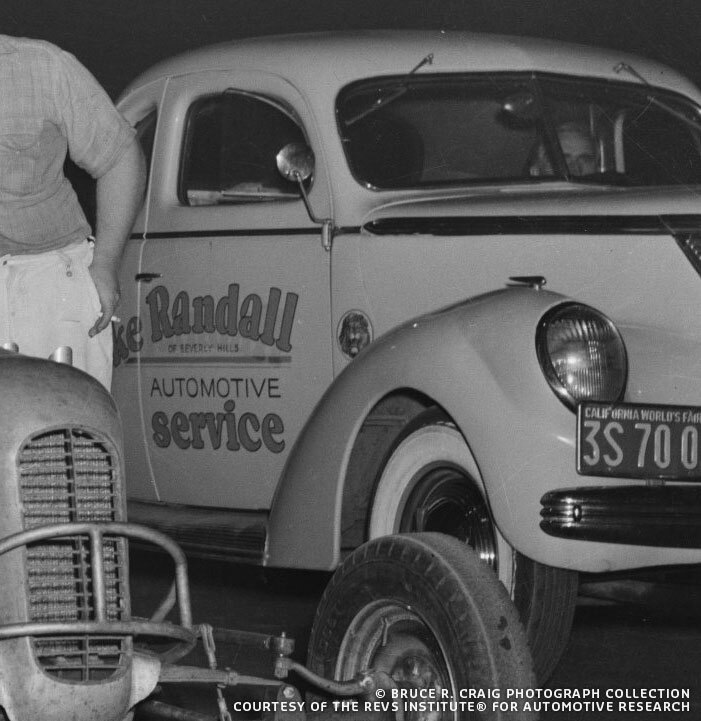 So far we have been unable to find any info on this 1937 Ford coupe turned pick up that was used by Mike Randall as a tow truck. It appeared in several photos of the Revs Collection and it showed some nice early restyling with wi reshaped rear of the car, smooth hood sides, custom headlights and aftermarket trim on the hood. This photo does show the reshaped rear of the body with the nicely shaped and chrome finished hold on bars. The hubcaps are small size single bar flippers, possibly early Cadillac units, but perhaps these are some early aftermarket units. 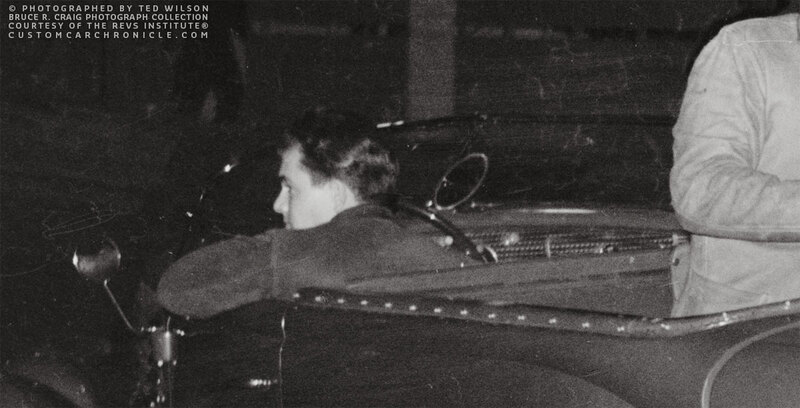 We have no idea why the name on the side of the car was taped off in this photo. 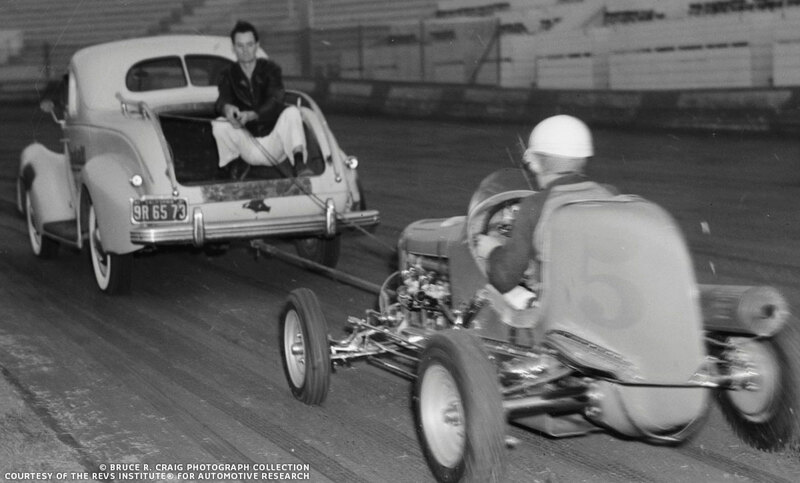 This photo shows the car pulling Pat Cunningham in the Gilmore stadium. We can see Cadillac bumper and that the car was now outfitted with a set of white wall tires. the photo was taken in 1941. Close up shows the Cadillac front bumper and the custom headlights. Possibly shaped after the Lincoln units, but it appears the headlight bezels are 1937 Ford units. The trim around the grille and hood is an early Eastern Auto aftermarket product. 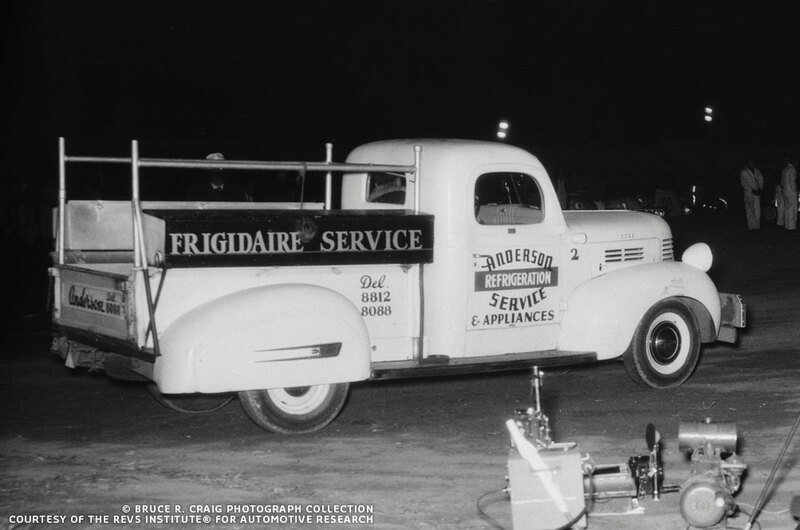 And the last photo that got my attention was this Anderson Frigidaire Service truck. Very mildy customized with Buick fender skirts and aftermarket hubcaps. And most likely repainted in refrigerator white. Notice the heavy bumper on the front. Rik’s research at its best! Thanks for these tantalizing glimpses into a time of creativity without limits. Form following the racer function, then spinning off in all directions as far as imaginations could reach. 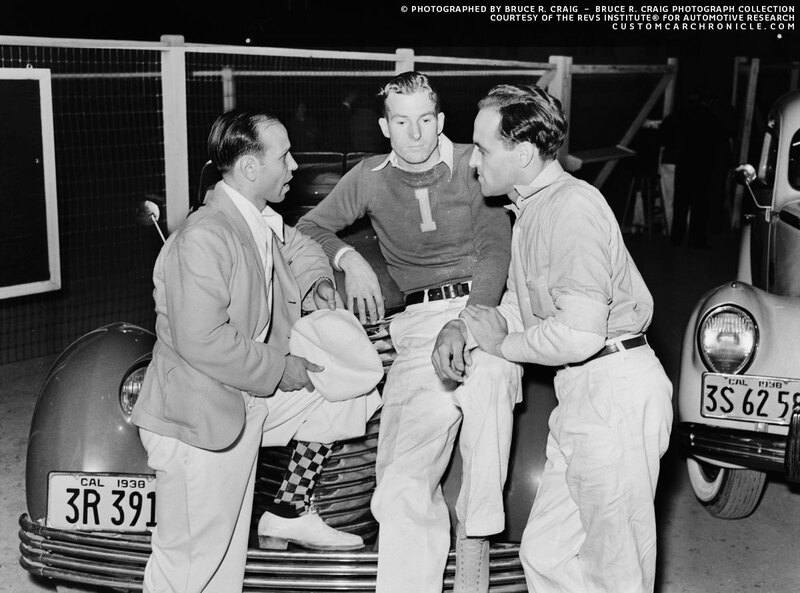 The Cecil Wentz story opened my eyes to the deep roots customizing had in the midget and sprint car circuits. The early “sportsters” that came out of that culture are our custom and hot rod ancestors. These images are priceless. Keep digging, Rik. Wow , Im blown away again by your article , so there was another custom pickup at the same time and place as the Socalif plating truck with -36 Cad bumpers ? Thanks for the article ! Great article Rik. Love seeing these early,early customs. And of course given my own custom build you know that I dig the Tow-truck aspect of it. This is really a sweet article…. 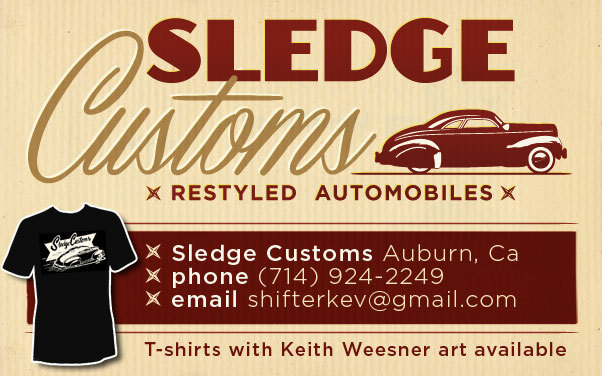 I mean you can not have a shop with out a kustom shop truck right…!!! Thoes little cast chrome fender trims in the photo are really kool….. And those love heart style grilles….. Amazing. 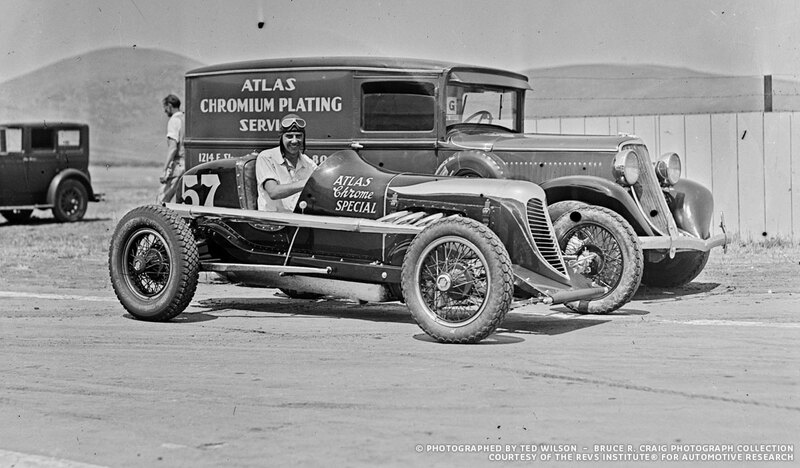 Are those Stock but Chromed headlights on the 34′ Ford Atlas Truck? Golly, what a group of pretty little pickups.